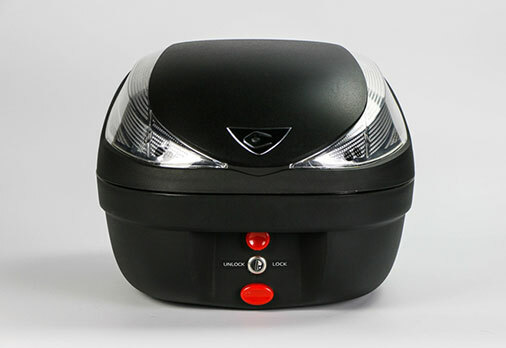 Coocase allows for customization of over 10 colours with its removable top panel, as well as 3 led light covers, giving it the ability to match any motorcycle. Lid panels are available in matte black, gloss black, gloss silver and ready-to-paint primer gray. Lenses are available in clear, smoke gray and red. You know, they say that there is a bike for every rider out there. As of now – there is a topcase for every bike as well. Not sure where to stow your helmet when you aren’t riding? 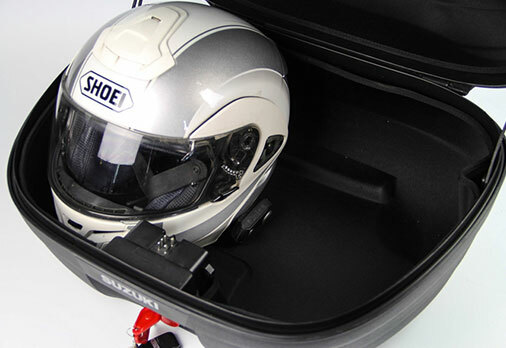 Each Coocase topcases is capable of holding a full-face helmet—the S48 Astra can hold two! And Coocase’s security features will ensure that your helmet will be completely safe. With Coocase, there’s no need to worry that your stuff will be safe. All Coocase Topcases come integrated with a security shock sensor – if the case is shaken, the alarm activates. A flashing LED security light activates when the case is armed. Even better, the topcase locks automatically 15 seconds after it has been unlocked! Coocase topcases can help you be seen! Each Coocase Topcase comes standard with an integrated LED brakelight. The brakelight system is quick-disconnect from the Coocase base plate — simply detach your Coocase and walk away, no wires to fuss with. Remote controlled locking system complete with security alarms deter robbery and thievery, and the case itself is made of a composite few times stronger than that of an average topcase.